On Wednesday, a Belgian broadcaster released the names of two of the Brussels attackers: Khalid and Brahim El Bakraoui. The brothers are both from the city and are thought to have carried out the two airport suicide bombings, although there are conflicting reports; for example, BBC News has reported that one brother may have carried out the metro attack. The two could be proof of a connection between Tuesday's attacks and the ISIS cell that carried out the Paris attacks in November — the brothers were both wanted by police due to a suspected link. 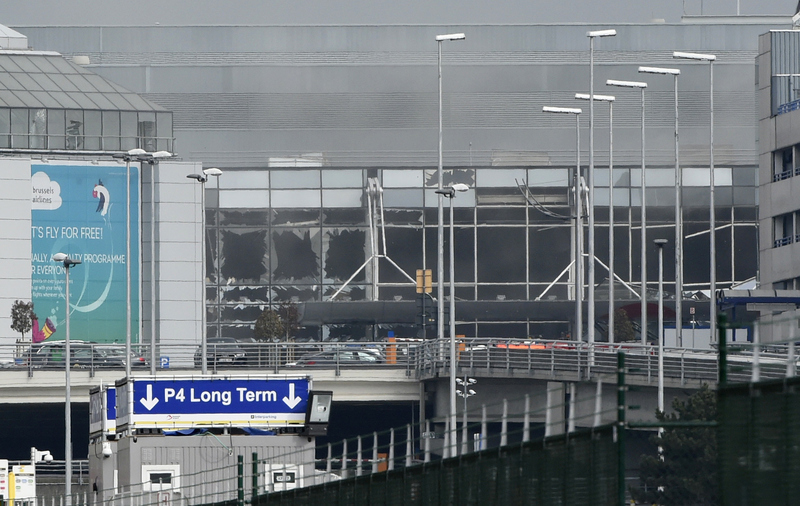 At least 31 people died in the Brussels attacks on Tuesday. Update: On Wednesday, a Belgian prosecutor confirmed that one brother, Khalid, was the suicide bomber on the metro. Ibrahim and another still unidentified suicide bomber attacked the airport. Authorities say several others possibly linked to the attacks are still on the loose. Details are still emerging about the possible connections to the Paris attackers, but one of the brothers, Khalid, rented an apartment under a false name. Police ended up raiding that apartment last week; a shootout took place, during which a suspect was killed. In that same apartment, police found a finger print of Salah Abdeslam, the suspect in the Paris attacks that was captured Friday. As a result, Khalid was being sought for terrorist activities, Belgian newspaper La Derniere Heure reported. The brothers can be seen in the photo of the attackers that was released by the police at the airport. The brothers are thought by police to be the two in black, both wearing single black gloves on their left hands. That could have been to hide detonation devices. The bombings went off in quick succession in the airport's departure hall. Images and video circulated on social media show passengers crouched next to check-in counters as smoke fills the room. The third man in the photo has also been identified by the police — and he's still on the run. He is thought to be Najim Laachraoui, who has been connected to the Paris bombings and Salah Abdeslam. Belgian authorities had been searching for him since Monday, as he was a known acquaintance of Abdeslam. Furthermore, his DNA was found on all the suicide vests used in the terrorist attack as well as in the apartment where they were made. The attacks in the airports occurred at around 8 a.m. local time. Less than two hours later another explosion would rock the Brussels metro system, just blocks from some of the European Union's most important institutions. The investigation continued overnight. A taxi driver tipped off police about a possible safe house when he recognized the suspects from a fare he drove to the airport. Inside the home police found a bomb, ISIS flag, and bomb making materials. ISIS has claimed responsibility for the attacks and has threatened that they are just the beginning. The U.S. State Department has issued a blanket travel warning covering all of Europe.